Honey is one of the most ancient elixir of life known to man since ages. It has wonderful healing properties. Therefore, it is very rightly called as “The Food of Gods” even in the developed scientific age. Still, we are unaware of the amazing medicinal properties of honey. If we think on the long term basis, we can get the most wonderful challenging effect of honey over chronic diseases. Honey can also be used to treat boils and external sores. We can compare Honey with that of sugar. Sugar does not have any nutritional value that is needed for our body, except carbohydrates. When we use refined sugar, it raises blood sugar level rapidly. It will cause dental caries and contributes to obesity. It may be one of the most common cause for Diabetes mellitus. It contains sugar as glucose, fructose, and sucrose. Glucose is the simplest of all sugar forms and can be assimilated directly in the blood. Fructose is commonly called as grape sugar. It is also known as laevulose. Its chemical composition is similar to that of glucose, however it crystallizes more rapidly than glucose. While glucose helps in restoring the oxygen level, fructose builds the tissues. Sucrose is a combination of fructose and glucose. It contains Dextrin, a gummy substance that can be assimilated by the blood directly and therefore digestible. Honey is one of greatest instant energy giving food given to us by the nature. It is often used as an energy booster in emergency cases like fatigue, hypoglycemia, and exhaustion. Eating a spoonful of honey gives energy in less than ten minutes. Honey with fresh, fruits and nuts makes an ideal diet for good health. Children can eat honey spread on the bread slices instead of jam or sauce. Honey has Mucolytic property. It can break down the mucous plugs and helps to bring out the sputum. We can use honey with adathoda (Adathoda vasica) leaf extract (30ml) and honey (10ml) on empty stomach is very much useful in case of cough. 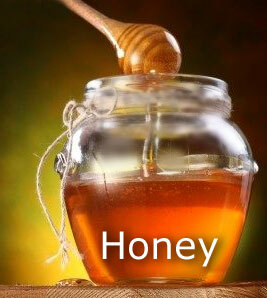 Honey if taken regularly, gives a clearer complexion. A spoonful of honey along with the juice of one medium sized lemon, taken every morning before break fast keeps the complexion clear. Honey can be taken along with cabbage juice on empty stomach helps to reduce weight. Honey with warm water if taken every morning also reduces weight. Honey and ginger (read more on health benefits of ginger) will prevent the gas formation after heavy meal and it also increases the digestion. Regular use honey with lemon juice also prevents digestive problems. Mix ginger juice with honey and lick this teaspoonful of mixture for treating continues hiccoughs. Cramps usually occur when the calcium present in the blood is at a lower level, while the phosphorus level is high. By taking honey, the required levels are maintained in the blood. So, regular intake of honey reduces the incidence of Cramps. Olive oil and Honey- These two combinations will simply make your skin feel wonderful. Make a paste of olive oil, honey and turmeric and apply to the skin. Honey can be used advantageously in case of Diabetes Mellitus as honey mainly contain laevulose 39% (D- Fructose), and Glucose 34% (D- glucose). While the glucose present is rapidly absorbed by the blood, Laevulose is assimilated slowly. This slower assimilation is however advantageous to the body as it does not lead to a sudden increase in the blood sugar level. Honey can be used in hypoglycemia very effectively instead of glucose/ sugar. Increases the absorption of calcium, phosphorus, iron etc.. Helps for proper functioning of cells for energy release, and repair. Helpful in proper functioning of Red Blood Cells and Nervous System. Proper development of Bones, Teeth and Tissues. Honey can be used safely in case of burns, blisters, ulcers even in case of bronchial asthma. According to Ayurveda, honey is always older the better for any treatment purpose. Honey doesn’t get spoiled. It can convert into crystals after several years. But keep in mind !